Once you add chickens to your homestead, delicious fresh eggs will likely become a regular part of your diet. But throwing out used eggshells after scrambling breakfast or baking a cake, however, wastes a valuable resource that can be reused in many different ways. Homesteaders who appreciate the delicate veneer of eggshells can use them for crafts — fill the shells with beeswax, essential oils, and twine to make easy DIY egg candles — but they can also have a functional purpose. Given their gritty texture, eggshells are a natural abrasive and can be used as a skin exfoliant or in natural cleaning products if crushed into a fine powder using a food processor or a mortar and pestle. Perhaps the most useful property of eggshells, however, is their composition. Eggshells are made almost entirely of calcium carbonate crystals, along with a smattering of proteins that gives the shell its strength. The free and easy source of this essential nutrient can be redistributed to a number of calcium-hungry residents on your homestead — including, perhaps, yourself. 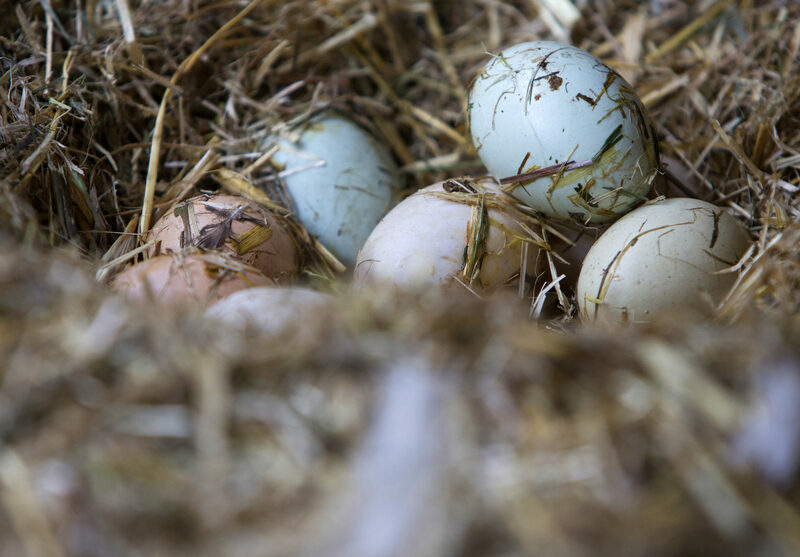 Lisa Steele, author of several books including “101 Chicken Keeping Hacks” and blogger at Fresh Eggs Daily, recommends giving eggshells back to your chickens as a calcium supplement. “Crush them up and give them to the chickens,” she says. “They need calcium to make more eggs.” Most chicken owners will give their chickens commercial calcium, which is usually made from pulverized oyster shells, but Steele says her chickens prefer their own eggshells. This may seem unorthodox, but don’t worry — Steele writes in her most recent book “101 Chicken Keeping Hacks” that it has not caused any unauthorized egg cannibalization (likely because the chickens aren’t pecking around for extra calcium with the added supplements already available). Make sure you rinse the eggshells before coarsely crushing them up and adding them to a dispenser or bowl in your chicken coop. Your dogs will also appreciate finely powdered eggshells mixed in their food to keep their bones and teeth strong. Eggshells are also an excellent fertilizer. Sprinkle crushed eggshells around the base of your plants for a boost of calcium. “If you put crushed eggshells around the base of your plant, it can also keep crawling bugs away,” Steele says. Is it harmful to eat eggshells? If it’s good enough for your chickens, it’s good enough for you, right? While you may not enjoy the gritty texture, it is not harmful to eat eggshells. In fact, eating eggshells is thought to be an effective natural way to increase your calcium intake to promote bone and joint health. “Some people grind them up in their food processors and put them in orange juice and drink as a calcium supplement,” Steele says. If you are going to eat eggshells, Steele recommends washing and sterilizing them, either by boiling them or putting them in the oven on low heat, to eliminate the risk of contracting salmonella. Make sure the shell fragments are finely pulverized so your calcium boost doesn’t turn into a choking hazard. Think twice before chucking the shells from your fresh morning omelette in the trash — repurposing eggshells reduces waste on your homestead while giving a little calcium to your plants, your pets, or yourself.